In the mid 1950s, Gary Snyder came to translate the poems of the Tang poet Han Shan (Cold Mountain) during his preparation to travel to Japan. After dropping out of graduate school in Indiana, he enrolled at UC Berkeley to study Oriental Languages. Snyder worked on his translations with the help of his professor who, Snyder once noted, had the basic canon of Chinese poetry memorized. There were at that time few translations of Han Shan with the best being the versions by Arthur Waley, the dean of Chinese literature in English translation by the 1950s. Snyder knew of these versions and used them. 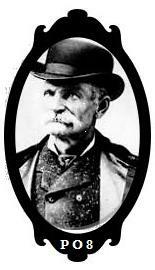 But before this account goes any farther the figure of Cold Mountain needs explanation. Han Shan was always a myth. Unlike most Chinese poets, his name is the name of a place, but this was generic, no explicit site. The religious figures in China always had the privilege of taking a place name in lieu of a family name. So his name alone puts Han Shan as an outsider. The word Han is an adjective for cold; the noun Shan means mountains(s), hill or a mountain range. So Han Shan in English was Cold Mountain. His translators accepted that his name was a religious title, and that his family name was lost along with any reliable account of his life and times. Buddhist masters of that period substituted their family name with the name of their monastery or hermitage. 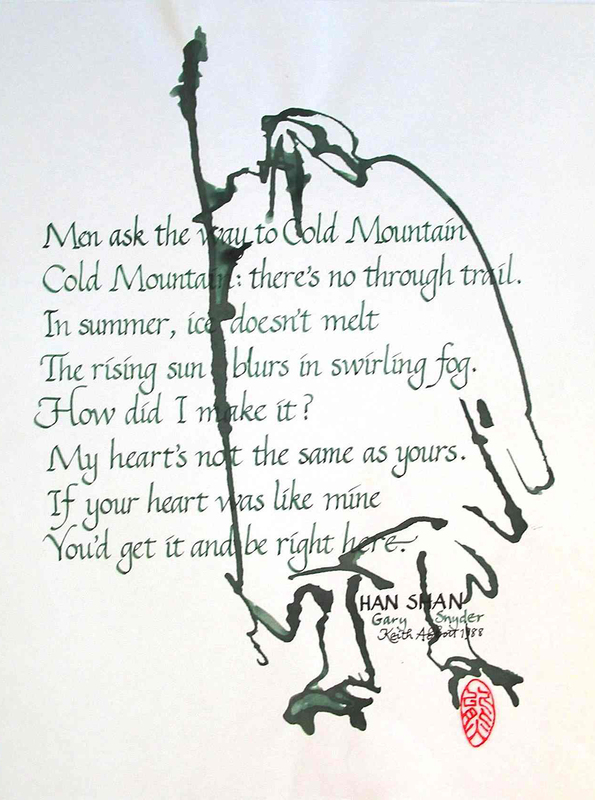 The poems demonstrate that Han Shan was a hermit for a part of his life, and perhaps a wandering monk. Most of the theology found in his poems is a mixture of Taoism and Buddhism, but not clear about what form of Buddhism. And as in most Chinese poems, references to Confucian classics are common. Tradition places Cold Mountain, the man and the place, in the Tiantai Mountains. This is the Tiantai range on current maps, located to the south of Shanghai. During the Tang and Song periods, many of the Buddhist sects in the mountain monasteries flourished and in Japan and the United States those lineages provide masters for Western Buddhism. The public imagery for Cold Mountain was set early. Han Shan was a hermit who lived near one of these monasteries. Inside the orphan Shi De worked in the kitchen and around the grounds he carried a broom. He put leftovers in a bamboo lunch pail for Han Shan and then the two retired to mess around, writing poems on trees, cliff or temple walls and reading blank scrolls and at night silently pointing to the moon. These icons proliferated in rubbings and paintings after the Tang dynasty and illustrations of the mad pair’s episodes became common monastery lore. But in China no official notice of Han Shan as a poet existed for five hundred years. His work was not included in Tang poetry anthologies. In his introduction to Chinese Poems, Arthur Waley sums up the qualities that made Han Shan so valuable as a visual icon. In his poems Cold Mountain is often the name of a state of mind rather than a locality. It is on this conception, as well as on that of the “hidden treasure”, the Buddha who is to be sought not somewhere outside us, but “at home” in the heart, that the mysticism of the poems is based. So the Cold Mountain name suggests Buddhist images of spiritual ascension and the image of a ragged but determined monk evokes the run-down hermitages of Taoist immortals. Han Shan presents this combination of person, place and state-of-mind. From within these hagiographic and iconic conventions, however, the poems themselves perform a different task. While talking about a Han Shan poem, Paul Kahn marks the change in this fashion. The presentation of ideas . . . is different from the poetic conventions of its period. Han Shan is not describing a vision he has had of an immortal while traveling in the mountains, nor is he describing his own personal enlightenment while journeying to a remote holy place, both common themes in Tang poetry. The poet here is stepping right into the landscape, climbing a path that is at once his own physical and metaphysical path or way. He tells us this is the “way” to his home as well as his enlightenment. He directs his voice to the reader, challenging (or inviting) him to follow. The first collection of Cold Mountain poems had a preface attributed to Luqiu Yin: “Nobody knows where Han Shan came from.” He describes how the elders of the community related to him stories of Han Shan’s life, primarily anecdotes of him appearing and disappearing in the halls of the Chan monasteries. His appearance resembles that of an emaciated beggar, but every word he uttered was pithy, meaningful and inspiring. He wore a cap made of birch bark, a simple fur garment, torn and threadbare, and wooden sandals for shoes. When the officially garbed Luqiu visits Guoqing Monastery he discovers both Han Shan and Shi De by the kitchen stove. Luqiu bows the two. In reply they yell, laugh, snigger and clap their hands before running up into the hills. The provincial governor tries to bribe them with gifts but they refuse. Han Shan is seen as an incarnation of the bodhisattva Manjusri—but that idea does not show up in any poems. What does appear in the poems is the notion of satori and how one gets it and what it looks like when one has it. The governor sends out a search party and when they find the two they duck into caves and the caves close behind them. Then the area is searched for any poems left behind and those are collected. Other accounts seem to have been written well after the date given for the poems and even this version is apocryphal. So ends the contemporary version of Han Shan. The figure of Han Shan remains a fictional character. With no reliable history of Han Shan or his sidekick Shi De (Kanzan and Jittoku in Japanese) the images of these crazy but sainted recluses survives as such good copy. Buddhist poetry as a genre in Chinese does not have a huge influential history or following, as Burton Watson has noted for his own translations of Han Shan. At the time Han Shan was not in the canon of Chinese poets: most major poets used images from Taoist or Confucian texts for their metaphors but Han Shan clearly used Buddhist imagery and allusions, too. The poetry and the figures of Han Shan and Shi De were, however, immensely important to Japanese Buddhism. Japanese paintings of the two crazy hermits giggling or pointing at the moon are common; important Buddhist priests painted many. 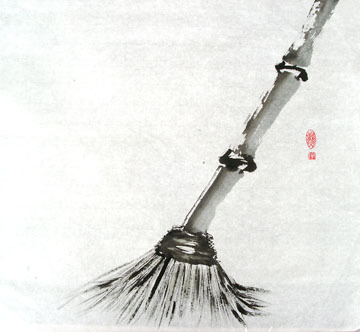 The two hermits’ symbols were Han Shan’s bamboo lunch bucket and Shi De’s broom and their shared blank scroll. Often paintings only showed one or more of the three objects together without any humans and that was enough to suggest total enlightenment. Translating Chinese poetry is difficult. The single characters themselves are rich with multiple meanings, multiple references and alternate allusions. Classically trained calligraphers only need to hear a line and they can provide the rest of the text. As a modern language Chinese has the least number of sounds; for a language with a 5,000-year past, this is striking. Each character has one syllable, normally. One of four tones is used for modern Chinese monosyllables to assign a relative meaning. So for the listener or reader to get a rapid apprehension of a particular character’s meaning a phrase is required. Context is all; relationships between words reveal more than a fixed substantive meaning. To complicate matters further there are no tenses for verbs and nouns are both singular and plural. When most read Chinese poetry in translation there are you and I and she and he in the poems. But those pronouns are hardly ever indicated by any single character in Chinese poems. The psychological self has no time or particular perspective in the poems although that is how most Western translators enter these poems. That extrapolation from no personal center to a narrator or I may derive from the poetic line of characters and their cumulative mood or spirit. Often the translator has to sense what has occurred to set off this particular poem, to create or better yet select these images to encapsulate a change. The change may come internally as the external details become harmonized in the poem’s flow. And certain common radiant characters, such as moon, allude to any number of poetic and spiritual contexts. So what is extraordinary about Snyder’s translations is that the character of Han Shan becomes so vivid. There are implied first person nouns used so we get a visceral sense of the hermit and his situation. This is Snyder’s gift: he comes alive inside this persona of Han Shan. So Han Shan’s vivacity arises from the translator’s own circumstances and experiences plus his intellectual training that imbue his versions with a voice for the poet. Not all of the 300 or so extant poems of Han Shan read like Snyder’s selections. Many are the poems of a husband and urban soul classically trained bureaucrat who has passed his civil service exam of poetry and ritual and secured a position. Snyder chose only those poems to translate through which he could express several ideals. 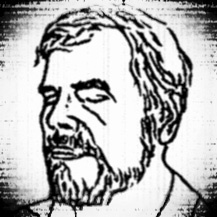 Such creatures as the ragged skeptical wise hobo who evinces a spiritual simplicity are American legends, too. The townsfolk scorn such strangers, and the authorities attempt to run them out of town. Our Westerns and folk songs celebrate such outsiders. Often their role is one of correction; their effect is to rebalance or harmonize some aspects of the town life and then leave. To get some idea of what Snyder saw and felt in the figure of Han Shan versus what a Sinologist such as Arthur Waley intuited we may contrast translations of the same Han Shan poem. The way up seems never to end. The stream so broad and the brush so tangled and thick. The pine-trees sing even when no wind blows. Waley’s notion is that the poet picks his way through some rocky terrain at the side of a valley. 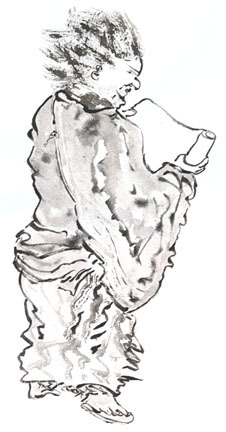 Probably the sage holds a walking stick in hand as travelers are commonly portrayed in Chinese painting, navigating a slightly tricky but winding horizontal path alongside a stream. The difficulty comes with shifting from side to side on the stream or while getting around thickets. Waley’s picture excludes danger, beyond a slip on the moss and a fall; there’s no steep drops or chances for landslides, cave-ins or avalanches. Nature has traps but negotiable pitfalls. This portrayal’s particulars are entirely congruent with the visual etiquette for centuries of landscape scrolls and could stand as a description of hundreds of them. The sage sits in a pavilion on a ledge with its roof obscured by white space or clouds. In Snyder’s short introductory note to his Cold Mountain Poems he described Han Shan and Shi De thusly: They became Immortals and you sometimes run onto them today in the skid rows, orchards, hobo jungles, and logging camps of America. In Snyder’s universe these two are real but unique people, and one may run across them reincarnated in certain places. So he has no qualms placing them in the mountains of that present reality: the West. Snyder’s sage faces a trail up a gorge blocked by boulders: we’re free to imagine their size and jumble. Underfoot are slippery loose rock, debris and pebbles: scree. The site is not a valley, but a ravine cut through rock, so balance, angles and gravity work against the traveling sage. He is, as Paul Kahn notes, probably down on his hands and knees in order to “clamber” over, under and through these obstacles. No matter what route this hermit picks, there’s only more chaos ahead. Chinese verse, much like 18th century English poetry and prose, often proceeds with parallel syntactical constructions to gain momentum, drama and/or cohesion between the lines. “No rain, no wind” are literal translations of the negative phrases in the Chinese. The speed of Snyder’s poem is quick, and its choice of words, like “world ties” much more incisive and dramatic. Jump cuts inside lines and jump cuts between lines from perception to perception mimic the experience of climbing up into a canyon wall and getting new views with every switchback, turnout and dip in the trail. Waley tuned his translation to any number of painted images of the sage in a mountain valley. Snyder gives us a translation that is based on a rock climber’s experience if that mountaineer were also a Buddhist monk. More than a translation Snyder creates a new poem in English by enlivening the original’s elements with a simplicity and vocabulary gained from real mountain climbing while under those elements flashes the depths of Buddhist thought and iconography. In his Lannan Archive video, Snyder remarks that at this point in his career he wanted “a poetry that was simple yet deep.” And on that tape as an example he reads from his Han Shan poems, discuss the monosyllabic effect of their lines, and how he tried to adapt that sound and its effect to his own poems in English, reading poems from his first book Riprap. His Han Shan poem feels lived, not transmuted from artistic scholarship like Waley’s—as impressive and useful as that act might be. Jack Kerouac dedicated his novel The Dharma Bums to Han Shan on the title page. One of the main characters Japhy Ryder is a fictional version of Gary Snyder. Kerouac fictionalizes himself as Ray Smith. The third chapter of the novel features Japhy Ryder’s translations from Han Shan, which are close to Snyder’s published versions. Dialogue between Smith and Ryder recreate the excitement over finding this poet and how his stance mirrors some of their attitudes. This popular novel presented Kerouac’s version of Han Shan for America and eventually as his fame spread for the rest of the world. Snyder’s version was at odds with Kerouac in certain ways. But with this novel’s fame Snyder moved into an international arena, one that he never has left. 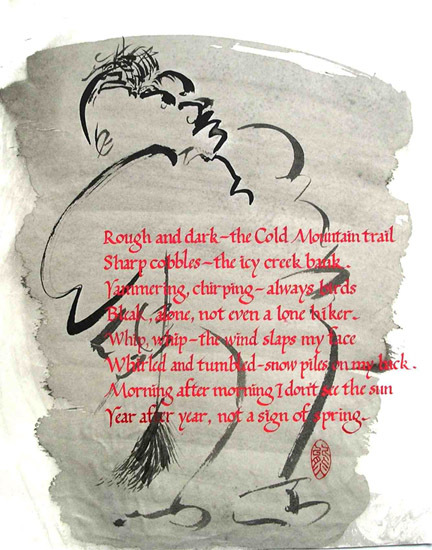 Cold Mountain poems showed him a way to write poems in English that were simple and deep at the same time. Poems in Riprap spring from his Chinese and Japanese studies, while poems in The Back Country build on that style and in some way evolve into another style or two. Kerouac was drawn to the Arhat image of Buddhism, the lonely ascetic self-denying monk. This monk enters samadhi and attains nirvana by himself with good old Emersonian self-reliance. Kerouac always wanted a little hut away from everyone to realize himself. This image reappears over and over in his work, espoused as the goal. However when he did get up on a fire lookout job for a month or so, he went bonkers over and over. His ideal was not what he really wanted after all. He then came to the conclusion that this ideal was not possible in America. Snyder made no such assumptions. Kerouac described Han Shan as Japhy Ryder and vice-versa. But both men were fictions at heart. Snyder was synthesizing elements of his life and he had the good fortune, ambition and sense to leave America for long periods of time. Kerouac left, too, but not with Snyder’s goals. He escaped a public perception he was a bum not a saint. Jack was much more innocent than Snyder, with fewer defenses. Snyder was persecuted, too, but he turned being blackballed by the State department from his lookout job to an advantage. But the self-reliant icon of Han Shan both in his and Kerouac’s version was crucial for his trajectory as a writer and a thinker and public figure. Keith Kumasen Abbott is a poet and calligrapher, and the author of numerous poetry books, novels and short story collections as well as the memoir Downstream from Trout Fishing In America (Astrophil Press, 2009). The ink drawings and calligraphy illustrating this essay are representations of his art. This entry was posted in Poetry, Poetry Society and tagged Arthur Waley, Buddhism, California, California Poetry, Cold Mountain, Gary Snyder, Han Shan, hermit poet, Keith Kumasen Abbott, Poetry, Poetry Blogs, Poetry Lectures, Poetry Lessons, Poetry Society, Poetry Talks, Poets, San Francisco, Schools of Poetry, The New Black Bart Poetry Society, translation. Bookmark the permalink.